An example of an image macro, once a common type of internet meme. An Internet meme, commonly known as just a meme (/miːm/ MEEM), is an activity, concept, catchphrase, or piece of media that spreads, often as mimicry or for humorous purposes, from person to person via the Internet. An Internet meme usually takes the form of an image (traditionally an image macro), GIF or video. It may be just a word or phrase, sometimes including intentional misspellings (such as in lolcats) or corrupted grammar (such as in doge and all your base are belong to us). These small movements tend to spread from person to person via social networks, blogs, direct email, or news sources. They may relate to various existing Internet cultures or subcultures, often created or spread on various websites. Fads and sensations tend to grow rapidly on the Internet because the instant communication facilitates word-of-mouth transmission. Some examples include posting a photo of people lying down in public places (called "planking") and uploading a short video of people dancing to the Harlem Shake. The word meme was coined by Richard Dawkins in his 1976 book The Selfish Gene as an attempt to explain the way cultural information spreads; the concept of the Internet meme was first proposed by Mike Godwin in the June 1993 issue of Wired. In 2013, Dawkins characterized an Internet meme as being a meme deliberately altered by human creativity—distinguished from biological genes and his own pre-Internet concept of a meme, which involved mutation by random change and spreading through accurate replication as in Darwinian selection. Dawkins explained that Internet memes are thus a "hijacking of the original idea", the very idea of a meme having mutated and evolved in this new direction. Furthermore, Internet memes carry an additional property that ordinary memes do not—Internet memes leave a footprint in the media through which they propagate (for example, social networks) that renders them traceable and analyzable. In the early days of the Internet, memes were primarily spread via email or Usenet discussion communities. Messageboards and newsgroups were also popular because they allowed a simple method for people to share information or memes with a diverse population of internet users in a short period. They encourage communication between people, and thus between meme sets, that do not normally come in contact. Furthermore, they actively promote meme-sharing within the messageboard or newsgroup population by asking for feedback, comments, opinions, etc. This format is what gave rise to early internet memes, like the Hampster Dance. Another factor in the increased meme transmission observed over the internet is its interactive nature. Print matter, radio, and television are all essentially passive experiences requiring the reader, listener, or viewer to perform all necessary cognitive processing; in contrast, the social nature of the Internet allows phenomena to propagate more readily. Many phenomena are also spread via web search engines, internet forums, social networking services, social news sites, and video hosting services. Much of the Internet's ability to spread information is assisted from results found through search engines, which can allow users to find memes even with obscure information. 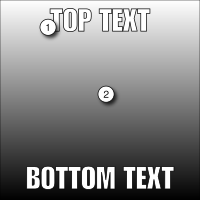 Typical format for image macros. Internet memes grew as a concept in the mid-1990s. At the time, memes were just short clips that were shared between people in Usenet forums. As the internet evolved, so did memes. When YouTube was released in 2005, video memes became popular. Around this time, rickrolling became popular and the link to this video was sent around via email or other messaging sites. Video sharing also created memes such as "Turn Down For What" and the "Harlem Shake". As social media websites such as Twitter and Facebook started appearing, it was now easy to share GIFs and image macros to a large audience. Meme generator websites were created to let users create their own memes out of existing templates. Memes during this time could remain popular for a long time, from a few months to a decade, which contrasts with the fast lifespan of modern memes. An Internet meme may stay the same or may evolve over time, by chance or through commentary, imitations, parody, or by incorporating news accounts about itself. Internet memes can evolve and spread extremely rapidly, sometimes reaching worldwide popularity within a few days. Internet memes usually are formed from some social interaction, pop culture reference, or situations people often find themselves in. Their rapid growth and impact has caught the attention of both researchers and industry. Academically, researchers model how they evolve and predict which memes will survive and spread throughout the Web. Commercially, they are used in viral marketing where they are an inexpensive form of mass advertising. One empirical approach studied meme characteristics and behavior independently from the networks in which they propagated, and reached a set of conclusions concerning successful meme propagation. For example, the study asserted that Internet memes not only compete for viewer attention generally resulting in a shorter life, but also, through user creativity, memes can collaborate with each other and achieve greater survival. Also, paradoxically, an individual meme that experiences a popularity peak significantly higher than its average popularity is not generally expected to survive unless it is unique, whereas a meme with no such popularity peak keeps being used together with other memes and thus has greater survivability. Multiple opposing studies on media psychology and communication have aimed to characterise and analyse the concept and representations in order to make it accessible for the academic research. Thus, Internet memes can be regarded as a unit of information which replicates via internet. This unit can replicate or mutate. This mutation instead of being generational follows more a viral pattern, giving the Internet memes generally a short life. Other theoretical problems with the Internet memes are their behaviour, their type of change, and their teleology. Writing for The Washington Post in 2013, Dominic Basulto asserted that with the growth of the Internet and the practices of the marketing and advertising industries, memes have come to transmit fewer snippets of human culture that could survive for centuries as originally envisioned by Dawkins, and instead transmit banality at the expense of big ideas. Dank memes are a subgenre of memes usually involving meme formats but in a different way to image macros. The term "dank", which means "a cold, damp place", was later adapted by marijuana smokers to refer to high-quality marijuana, and then became an ironic term for a type of meme, and also becoming synonymous for "cool". This term originally meant a meme that was significantly different from the norm, but is now used mainly to differentiate these modern types of memes from other, older types such as image macros. Dank memes can also refer to "exceptionally unique or odd" memes. They have been described as "internet in-jokes" that are "so played out that they become funny again" or are "so nonsensical that they are hilarious". The formats are usually from popular television shows, movies, or video games (such as SpongeBob and The Simpsons) and users then add humorous text and images over it. One example of a "dank" meme is the "Who Killed Hannibal", which is made of two frames from a 2013 episode of The Eric Andre Show. The meme features the host Andre shooting his co-host Buress in the first frame and then blaming someone else in the second. This was then adapted to other situations, such as baby boomers blaming millennials for problems that they allegedly caused. Dank memes can also stem from interesting real-life images that get shared or remixed many times. So-called "moth" memes (often stylized with diacritics on the "o": "möth") came about after a Reddit user posted a close up picture of a moth that they had found outside their window onto the r/creepy subreddit. This image of a moth became popular, and began to be used in memes. These moth memes usually revolved around the moth wanting to find a lamp. According to Chris Grinter, a lepidopterist from the California Academy of Sciences, these memes took off because people find moths' attraction to lamps quite strange and this phenomenon is still not completely explained by science. Many modern memes stem from nonsense or otherwise unrelated phrases that are then repeated and placed onto other formats. One example of this is "they did surgery on a grape," from a video of a da Vinci Surgical System performing test surgery on a grape. People sharing the post tended to add the same caption to it ("they did surgery on a grape"), and eventually created a satirical image with several layers of captions on it. Memes such as this one continue to propagate as people start to include the phrase in different, otherwise unrelated memes. The increasing trend towards irony in meme culture has resulted in absurdist memes not unlike postmodern art. Many internet memes have several layers of meaning built off of other memes, not being understandable unless the viewer has seen all previous memes. "Deep-fried" memes, memes that have been distorted and run through several filters, are often counter-culture and strange to one not familiar with them. An example of these memes is the "E" meme, a picture of Markiplier photoshopped onto Lord Farquaad from the movie Shrek, photoshopped into a scene from Mark Zuckerberg's hearing in Congress. "Surreal" memes are based on the idea of increasing layers of irony so that they are not understandable by popular culture or corporations. The strange irony has been discussed in the Washington Post article "Why is millennial humor so weird?" as a disconnect from how millennials and other generations conceive of humor; the article itself also became a meme where people photoshopped examples of deep-fried and surreal memes onto the article to make fun of the point of the article and the abstraction of meme culture. After the success of the application Vine, a new format of memes was created in the form of short videos and scripted sketches. Vine, in spite of its closure in early 2017, has still retained success through uploads of viral vines onto other sharing social media sites such as Twitter and YouTube. Users on said websites will often upload Vine "compilations", sometimes relating to a theme assigned to the vines or just a collection of assorted vine videos. Public relations, advertising, and marketing professionals have embraced Internet memes as a form of viral marketing and guerrilla marketing to create marketing "buzz" for their product or service. The practice of using memes to market products or services is known as memetic marketing. Internet memes are seen as cost-effective, and because they are a (sometimes self-conscious) fad, they are therefore used as a way to create an image of awareness or trendiness. To this end, businesses have taken to attempting two methods of using memes to increase publicity and sales of their company; either creating a meme or attempting to adapt or perpetuate an existing one. Marketers, for example, use Internet memes to create interest in films that would otherwise not generate positive publicity among critics. The 2006 film Snakes on a Plane generated much publicity via this method. Used in the context of public relations, the term would be more of an advertising buzzword than a proper Internet meme, although there is still an implication that the interest in the content is for purposes of trivia, ephemera, or frivolity rather than straightforward advertising and news. Examples of memetic marketing include the FreeCreditReport.com singing ad campaign, the "Nope, Chuck Testa" meme from an advertisement for taxidermist Chuck Testa, Wilford Brimley saying "Diabeetus" from Liberty Medical and the Dumb Ways to Die public announcement ad campaign by Metro Trains Melbourne. ^ "American Pronunciation of meme by Macmillan Dictionary". www.macmillandictionary.com. Retrieved 2017-04-19. ^ Shifman, Limor. Memes in Digital Culture. Print. ^ a b c d Coscia, Michele (April 5, 2013). "Competition and Success in the Meme Pool: a Case Study on Quickmeme.com". arXiv:1304.1712 [physics.soc-ph]. Paper explained for laymen by Mims, Christopher (June 28, 2013). "Why you'll share this story: The new science of memes". Quartz. Archived from the original on July 18, 2013. ^ "Memes On the Internet". Oracle Thinkquest. Archived from the original on 11 May 2013. Retrieved 30 November 2012. ^ Marshall, Garry. "The Internet and Memetics". School of Computing Science, Middlesex University. Retrieved 30 November 2012. ^ Watercutter, Angela; Grey Ellisby, Emma (April 2018). "The WIRED Guide to Memes". WIRED. Retrieved 2018-11-30. ^ Kempe, David; Kleinberg, Jon; Tardos, Éva (2003). "Maximizing the spread of influence through a social network". Int. Conf. on Knowledge Discovery and Data Mining. ACM Press. doi:10.1145/956750.956769. ^ a b Castaño, Carlos (2013). "Defining and Characterising the Concept of Internet Meme". Revista CES Psicología. 6 (2): 82–104. ISSN 2011-3080. Retrieved 23 April 2015. ^ Julien, Chris (2014-06-30). "Bourdieu, Social Capital and Online Interaction". Sociology. 49 (2): 356–373. doi:10.1177/0038038514535862. ^ Zetter, K. (29 February 2008). "Humans Are Just Machines for Propagating Memes". Wired website. ^ Basulto, Dominic (July 5, 2013). "Have Internet memes lost their meaning?". The Washington Post. Archived from the original on July 10, 2013. ^ Hoffman, Ashley (2 February 2018). "Donald Trump Jr. Just Became a Dank Meme, Literally". TIME. Retrieved 19 May 2018. ^ "Dank Memes - What does dank meme mean?". Dictionary.com. Retrieved 30 Nov 2018. ^ Griffin, Annaliese (9 March 2018). "What does "dank" mean? A definition of everyone's new favourite adjective". Quartzy. Retrieved 19 May 2018. ^ Mary von Aue (19 April 2018). "Meme About 'Who Killed Hannibal' Is Reddit's Current Obsession". Inverse. Retrieved 19 May 2018. ^ u/No_Reason27 (July 2018). "Close up of moth outside my window". Reddit. Retrieved 30 November 2018. ^ Spalding, Katie (2 Oct 2018). "The Latest Viral Meme Trend Is (Possibly) Not As Stupid As You Think". IFL Science. Retrieved 30 Nov 2018. ^ EdwardHospital (11 August 2010). "da Vinci Surgical System: Surgery on a grape". Retrieved 30 November 2018 – via YouTube. ^ Feldman, Brian. "They Did Surgery on a Grape". Intelligencer. NYMag. Retrieved 27 November 2018. ^ Hess, Peter. ""They Did Surgery on a Grape" Meme Began With Legally Suspect Medical Tool". Inverse. Retrieved 27 November 2018. ^ Santiago, Amanda Luz Henning. "'They did surgery on a grape' is the weird meme that's your new obsession". Mashable. Retrieved 27 November 2018. ^ Know Your Meme. "Deep-fried memes". Retrieved 26 March, 2019. ^ The Daily Dot. (2018). "The ‘E’ meme shows just how weird memes can get". Retrieved 26 March, 2019. ^ Mashable. (2019). "Surreal memes deserve their own internet dimension". Retrieved 26 March, 2019. ^ Washington Post. (2017). "Why is millennial humor so weird?" Retrieved 26 March, 2019. ^ Know Your Meme. "Why is millennial humor so weird?" Retrieved 26 March, 2019. ^ Hathaway, Jay (December 9, 2015). "Tumblr's Biggest Meme of 2015 Was Pepe the Frog". New York Magazine. Archived from the original on July 25, 2017. Retrieved 2017-09-14. ^ "Pepe the Frog". Know Your Meme. Retrieved 2018-08-21. ^ "We Asked The Art World How Much Rare Pepes Are Going For". BuzzFeed News. Retrieved 2018-08-21. ^ "About US – Rare Pepe Directory". rarepepedirectory.com. p. 122. Retrieved 2018-08-21. ^ Nuzzi, Olivia (May 26, 2016). "How Pepe the Frog Became a Nazi Trump Supporter and Alt-Right Symbol". The Daily Beast. Retrieved May 26, 2016. ^ "Pepe the Frog". Anti-Defamation League. Retrieved 2018-12-10. ^ Plaugic, Lizzie (2017-01-10). "How a group of Redditors is creating a fake stock market to figure out the value of memes". The Verge. Retrieved 2018-12-10. ^ "Reddit post on r/MemeEconomy detailing name controversy with NASDAQ stock exchange". Reddit. 2017-12-15. Retrieved 2018-12-18. ^ Flor, Nick (December 11, 2000). "Memetic Marketing". InformIT. Retrieved 2011-07-29. ^ Council, Forbes Communications. "Meme Marketing: How Brands Are Speaking A New Consumer Language". Forbes. Retrieved 2018-12-10. ^ Carr, David (29 May 2006). "Hollywood bypassing critics and print as digital gets hotter". New York Times. Retrieved 16 October 2012. ^ "We Found The FreeCreditReport.Com Band, and They Aren't Who You Thought They Were". PigeonsandPlanes. Retrieved 2017-04-19. ^ "diabeetus - WordSense.eu". www.wordsense.eu. Retrieved 2017-04-19. Blackmore, Susan (March 16, 2000). The Meme Machine (Volume 25 of Popular Science Series ed.). Oxford University Press, 2000. p. 288. ISBN 978-0192862129. Retrieved 30 November 2012. Shifman, Limor (Nov 8, 2013). Memes in Digital Culture. MIT Press, 2013. Distin, K. (2005). The selfish meme: A critical reassessment. Cambridge, U.K: Cambridge. 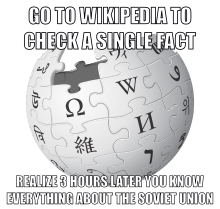 Wikimedia Commons has media related to Internet memes. Gary Marshall, The Internet and Memetics – academic article about Internet and memes. This page was last edited on 14 April 2019, at 04:19 (UTC).